There you go bringing back the nostalgia again! Guess who I had my first taste of boba tea with? My beloved Dave! They are still in style with me! I remember going on boba runs nearly everyday after school! The first time I ever had boba nai cha was at the Tea Station in Chinatown over 10 years ago. Because the menus of other boba shops (Tap-Ex, Volcano, etc) became so saturated with dozens of other items, nowadays I like going back to that particular location for old times sake b/c the menu is so sparse and simple. very nicely done. your writing has been on! keep up the good work. btw, for these "cooler" days that we've been having, a hot cup of the lavendar milk tea does the trick nicely. Good catch, I forgot to put the prices on there. I've edited the post now. I'm sure of the prices for the tea and the pork chop rice plate, but the tea egg price I guessed. It's about a buck each. I think. That sounds awesome. I don't even think it needs boba. HAHA! Well, how can I object to that! 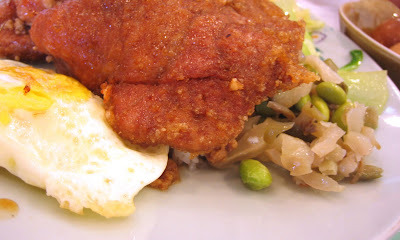 I remember when I had to drive to Monterey Park to this now defunct restaurant called Shau May to get it. Within a few months, it was everywhere! I believe I've tried a lavender milk tea once. It was quite lavender-y! I didn't expect it to be so, but I liked it. You were right on point w/ the feeling of quaintness that I get whenever I have a boba drink nowadays (unless it's something "new" to me like a black sesame milk tea smoothie with boba). Erego, I like how you focused on the good food that usually comes w/ the boba menu at these tea houses (ahem* pepper crispy squid, fish balls, and popcorn chicken). You know what ultimately got me, though? The words "actually tastes like tea" and "chicharon." Oh. hell. yes. Pure genius. I wonder if there's a place up here that does such similarly delightful things to their pork AND their tea. I predict that the next "food trend" will be...hmmm, let's research here for a moment. It's the first day of fall today, so maybe the new trend will be a "create your own hot bevarage" joint :) like hot chocolate or tea, with "sides" like honey, marshmallows, whipped cream, caramel, cacao nibs, lavender infused cream...in other words, a pimped-out Starbucks! I order the bubble tea once and I got a FREE long hair with the pearls! I never want to go back there again! Boohoo give me phobia! This place is my dessert shop after we have a filling meal at Sam Woo BBQ! You are so right, so many boba places have drinks that come straight from a jug/concentrate that people take for granted what real tea really should taste like! Now that I'm an OC transplant from the SGV, where real boba places are a dime a dozen, I crave the short drive for the nearest tea place (ever try Old Country Cafe in Alhambra?). Irvine is almost 25 minutes away, but it'll have to do! Thanks for the reliably enlightening commentary! Yea! We are going on vacation next month to visit friends in Irvine. Now I know where to go for bubble tea, since I have never tried it. We do not have tea shops in my area. I do order my green tea online. How could I forget about the fried crispy squid, fish ball, and popcron chicken, dusted with that spicy salt. And oooh...I love that idea. A hot beverage shop, maybe even warm apple cider, perhaps even hot Vietnamese che...that's a million dollar idea! Well, yeah! That'd put me off too! Knock on wood. 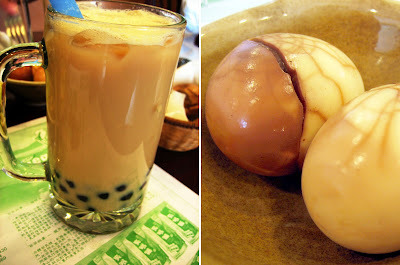 Back in the day, I would travel dozens of miles just to get a boba milk tea, and then after that phase, the pudding milk tea. I'm not sure if it's just me getting old though. But it's nice when you can get a real quality tea! Even if it costs a little more. Hope you have a fun time here! 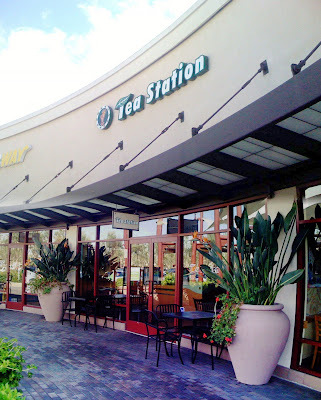 There's two locations of Tea Station in Irvine, by the way. The other one is at the Irvine Spectrum, which I'm sure your friend will take you to. It's where the action is around here. btw, would you mind sending me your e-mail to shigoblogs@gmail.com? I'd like to try to get some OC foodbloggers together for a night at Silk Thai, which is my newest, favoritest Thai restaurant in OC. Your pictures make everything look good. Hey I started facebook group named "OC Restaurants & Bars" few months ago. I was hoping you and other food bloggers to join and participate and even promote your blog sites. One more thing to add.. and this regards to your previous post. I tried Beurre Blanc flavored mochi ice cream at Mochilato, and it was heavenly. You must try! That pork chop looks damn good. And anything that crackles like a chicharon must be delicious. But Tea Eggs, Beef Scallion Wrap & Pork Stew Rice here are awesome! Beurre Blanc flavored mochi sounds crazy! Wine and butter sauce?! I don't go as often as you obviously. But the less I do, the better the nostalgia! Restauranteurs should realize that they should just cut the middle man and offer chicharons! I'm with you. I prefer pudding milk tea over boba milk tea. Less chewing involved. Lol. Beat me to another one. Good times. great stuff! don't suppose anyone knows of a recipe for the "soy-stewed ground pork." that stuff is a meal in itself imho. keep up the great reviews elmo! I'd also like that recipe. All it needs is rice, and bam, that's a meal. hahah. boba is totally a has-been... but i still get it in taipei sometimes- i like the mini-boba and when the tea tastes like tea. I don't really like the boba milk tea at this place. The boba are hard and the tea doesn't taste like anything. I have to say that I like Lollicup better.